The one day summit features exhibitions, workshops and panel discussions with international and local keynote speakers on the future of the mobile industry. 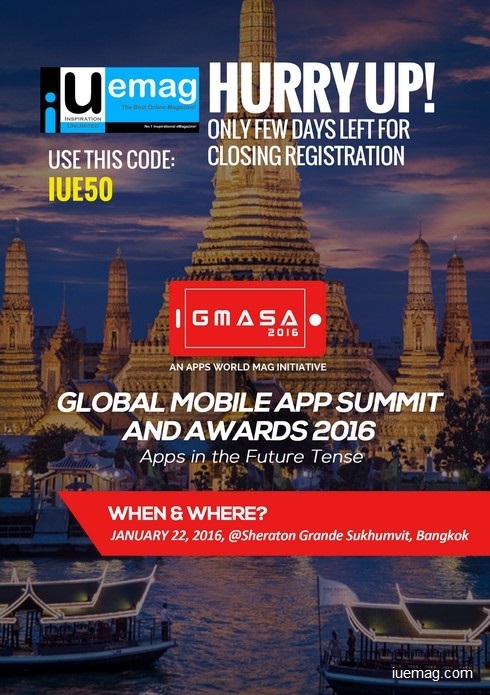 Bangkok plays host to the second Global Mobile App Summit & Awards 2016 (GMASA 2016), organized by Apps World Mag, bringing together mobile media experts of the industry, focusing on the latest strategies and trends in the mobile app industry. GMASA 2016 will be held on January 22, 2016 at the iconic Sheraton Grande Sukhumvit hotel in Bangkok. The Summit will see industry pioneers, investors, head honchos of multi-million dollar companies and app developers converge under the same roof. Along with panel discussions and speeches by keynote speakers, the Summit will also have an exhibition featuring the latest innovations in the industry which will indicate the future direction of mobile. GMASA 2016 will also give participants an idea of how to thrive in an ever-crowded marketplace. As with GMASA 2015, one of the most important features of GMASA 2016 will be the networking opportunities for delegates to get to know thought leaders, experienced investors, powerful executives and brilliant developers. GMASA 2016 will be held in Bangkok, a hub of international business, one of the world’s top tourist destinations and the capital of Thailand. The day’s events will broadly cover the areas of Mobile Game Development, App Monetization, App Analytics, App Security and App Marketing. Some of the topics that will be discussed at the summit — with many more exciting topics to be added — are ‘Games for Wearables – Solving the Mystery’, ‘Mobile Game Development – Future and Ahead’, ‘Localization – Key for Success in the Emerging Markets’ and ‘How to Make Incentivized Installs Work For Your Game’. GMASA 2015, the inaugural edition of the Summit, set the bar high, from discussing trends in the industry to debating where mobile is headed in the short to medium term to how to adapt and succeed in the changing business environment. GMASA 2016 Bangkok aims to meet the standards laid by the inaugural Summit, and surpass it. Attendees will also have an opportunity to network with the mobile industry’s top and prominent experts who will share their expertise and insights on what is influencing the industry, the road ahead and how to thrive in this ever­crowded marketplace. The Global Mobile App Summit & Awards 2016 (GMASA 2016) brings together mobile media experts of the industry, focusing on the latest strategies and trends in the mobile app industry. The first GMASA was held in Chennai, India in April 2015 where app developers, marketers and managers, along with executives from some of the most dynamic and forward­thinking companies in the world converged. The conference includes exhibitions, panel discussions, workshops, keynote speakers and networking opportunities. Visit http://bangkok2016.gmasa.org for details. Organised by Apps World Mag, this summit will bring together mobile media experts, executives, investors and developers of the industry from Thailand and around the region, focusing on the latest strategies and trends in the mobile app industry. Any facts, figures or references stated here are made by the author & don't reflect the endorsement of iU at all times unless otherwise drafted by official staff at iU. This article was first published here on 7th January 2016.